You're beginning to look a lot like Christmas! 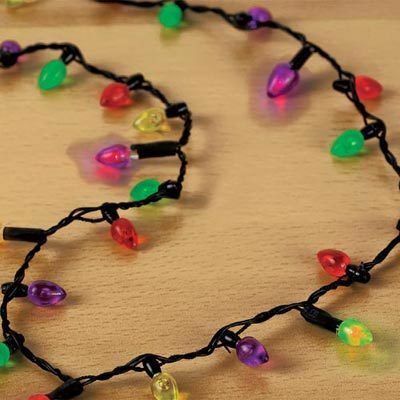 Slip on this fun, plastic Blinking Lights Necklace to light up any outfit. Order several as delightful presents or party favors. Six colorful bulbs light up and blink. On/off switch. Uses 2 CR-1220 button cell batteries (included). 5-6 hours of continuous use. 30"l.
Just love the necklace. I bought two as gifts. One for a teacher and the other for grandchild. They love them. Perfect for Christmas. The blinking lights makes it extra special. 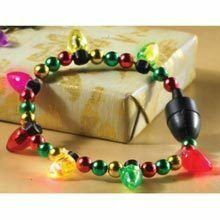 "The description says you get several different light up colors - but mine had only red ones light up. There are only 6 bulbs that light up. However, my 4 year old grand niece (and her 31 year old mom) loved it! They are pretty and festive. I'm ordering another to see if I get multi colors this time..."
I bought two back in Oct. for Christmas. I just started wearing and everyone that has saw it wants one! My daughter loves it also.